Bind Mi Band: Update 1.22: What's next? This post is a continuation of our release announcement of update 1.21. Read it first to learn about our latest features. We were not in contact for really long time since release 1.20, so today I want to share with you on my thoughts about the future features for "Bind Mi Band". Firstly, this wasn't right that it took so much time to make an update from the previous release. That's why I believe that next updates should be more granular and more often. Another thing is that it's better to work on one thing at a time. But there are so many of them! And you will help me to choose what to do! Further, you will find a poll where you can leave your vote and share your opinion on what should be done next. Originally, it was in a plan for this release to have a possibility to remove activities, like incorrectly detected sleep. But to make everything work really great, we need to improve our OneDrive sync feature, so practically all the data app has, will be synchronized with the cloud (right now it's only day's summary, not individual activities). We have a pretty good plan on how to do this, but it was decided not to delay the release even further, so this feature was postponed. On the side note: our users love our OneDrive sync since they know that their data is not stored anywhere else (especially, in China :D). For us it's also good: we don't need to maintain a backend (though, it would be really fun to do!) and don't need to make users pay for it. So, extending OneDrive sync is a way forward for us. The only question is "when: now or later?". It is possible to utilize Mi Band's HR sensor in continuous measurement mode for a short period, like training. So we can do that and will measure calories you burnt while knowing your HR. Also, we will send a notification when your HR peaks. Not really sure here what is possible, but something like this seems to be doable. What we cannot do: continuous HR measurements 24/7. Mi Band does not have such mode itself, so it should be the app which asks it to measure pulse every 5 minute or so. The problem is that the app should be active to access Bluetooth. And, of course, we can't/won't have our app active all the time. Background tasks on Windows do not allow such access too. At least, when we tried last time. The same thing concerns Live Tile, by the way. What we don't want to do: running mode with GPS. There are plenty of decent apps for running with GPS tracking, based on phone's sensor, and we don't even want to start to compete with them. That would be another story if Mi Band had GPS sensor, but otherwise, it does not make much sense. Many people ask to convert app's UI to UWP or even Fluent Design. Well, I can confess here of being a bit lazy and having now app compiled for 8.1 only. We can make a separate app package for UWP. Right now everything new coming from Microsoft is UWP-only. But it's very unfair to all the 8.1-folk, IMO. Their numbers are lowering every month, but there are still many of them. But maybe it's time to move forward now? Btw, when talking about making UWP app, I don't mean creating a desktop version and let me explain why. In this case, a new segment of users appears - people who use Mi Fit on their Android/iOS and Windows as their desktop. From one side it's good, but from the other - it puts on us requirements to be 95% compliant with Xiaomi's protocols, authentication, and cloud (which all are closed source and non-documented). Why will we need this? To offer a seamless multidevice synchronization user experience, which you would expect. Reverse-engineering Xiaomi's cloud and authentication is doable, but not something I would like to do. Also, I wouldn't want to have a strong dependency on their services, so it means that we have to be flexible about this. This implies even larger amount work, so I'm very skeptical about this direction. Recently, while checking Microsoft's docs, I noticed that some of the APIs, which were previously locked for OEMs-only, are available now for the public. So phone call and SMS notifications might work now. Only for Windows 10, unfortunately. I haven't yet given it a try, but it's an investigation which can pay off with some new features for Notify Mi Band and make it non-beta, finally. Sounds interesting, but no promises here. That's a thing which is bothering me for a long time now. Current displaying of walking activity in list view is not representative at all. 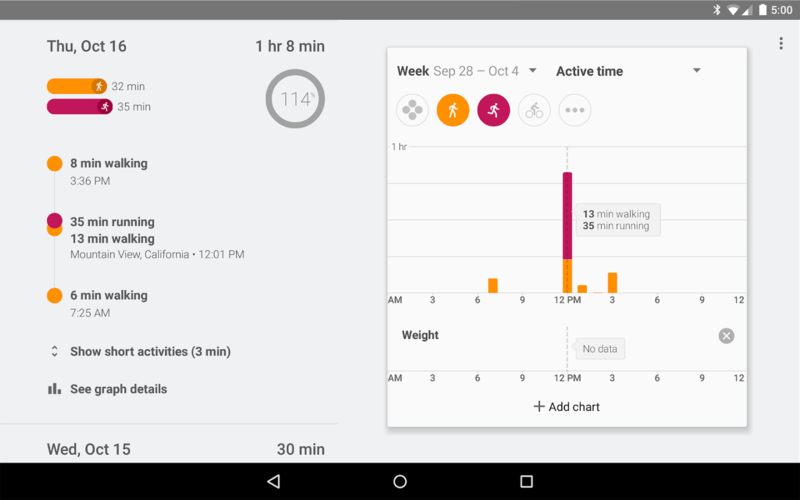 It would be much better to have some hourly graph like Google Fit has (see the link). But not so many people ask about it, so maybe this does not matter? Do you want to see more stats and history views? Monthly/yearly history view, average steps/sleep minutes? Personal records? Walking days strike length? BMI index? All those numbers that you look at first and never use after? If yes, let me know! I believe that all of these options are equally good. That makes it so hard to choose. Please, proceed by this link to participate in the poll. I won't promise that idea with most of the votes will be my next thing to do, the right of final decision still stays with me. But your opinion matters. Thanks! Awesome news! I've voted for the remake steps history, as I agree with you, a fitbit/Google fit representation is much more legible and useful. As for the UWP point, being a W10M user, I would vote for it too, WP8.1 is EOL'ed now, but it dépends also on the ratio WP/W10M amongst your app users. Final point: BMI etc. would be interesting, but if I have to enter my weight manually, I wouldn't do it, as most users. My fitbit account is linked to my withings scale, it fetches my body fat/weight info automatically. I notice that recording bike activity isn't possible... No solution for that ? Even if I put my band in my socks 😃? As I know, W10M must be minority of minority WP users. But in my case I've been a fan of Bind Mi Band because of mainly Notify Mi Band w/ Lumia 950. I also have some WP8.1s though. Voted: Training mode for me. Great work!!! Useful information added. I love it. For me, training mode would be a step up for the app. The training mode and incoming calls notification would be fantastic improvements. Thanks for your efforts and support everyday. It is a very good job. Thanks a lot! #4 incoming calls is definitely the only thing I'm missing so far! Oh, I forgot, I have a proposition which is not on your list: the possibility to export the OneDrive database, in CSV or XLS format. To be able to process it, or view on a year, etc. because I bought the Band and the App just to have vibrations for messages and calls, not for fitness reasons - and so I'm not satisfied with your solution till now! I'm ready to provide any additional details to fix the issue. Please, write us on email and let us know your MS account email address. Thanks! I have small trouble with connecting after update. But after few refresh, its connect after all.. But for me, there is one thing what I would like to have. And that thing is Smart alarm.. Is it possible to try it? Especially now, when we have rate data during sleep? I know that Xiomi take it back, but no idea why :(. Smart alarm has to be implemented in the firmware. All sleep analysis that we perform is done during the synchronization which can happen only when app is active. Please do not give up on WP8.1 users as M$ did (even on WP10 btw). It's already hard to find decent apps, so do not remove an other one! Maybe it would be great to support Xiamomi Mi Scale? Three and four. UWP is the future. I have the Mi band 2 and it works very well, but I am interested in buying me the amazfit beep. Would the application work with AMAZFIT BIP? Training mode, please! Mi Band is more accurate for training than receiving notifications. Э-э-эх.... Я так ждал подарок к новому году, однако чуда не произошло :) Всех с праздником! Training mode - I understand that it is not an option to have an internal workflow recorder for the application, but is there any way to make it paired with other exercise applications? In android it is possible, with Endomodo and Runtastic for example, but before it is necessary to allow inside the IM FIT application. Can you update this app for Xiaomi amazfit? Full support for AMAZFIT BIP, please. Funktioniert super mit dem Mi Band, eine Unterstützung für die Amazfit Watch wäre perfekt, geht aber jetzt schon ganz gut. Danke. Soporte para AMAZFIT BIP, por favor. I can't update...what can I do? Please support Amazfit BIP. I love the watch, I love my Lumia. This duo will be fantastic! Great work, thanks very much! The only request I have is - Amazfit BIP GPS tracking and (TCX) export! Hi. I don't know if you're still working on this, but if you are I personally think the most important thing to add is phone calls notification. Today the app notifies but only when the call is missed. Bind Mi Band is the best app available - even compared to the various apps on Android or the original MiFit. Unfortunately I have switched to Android and can't use it anymore. Hey. Really great work. Are you still developing this app in 2018?. Thank you. Is this app still in developing?